If you have not taken the Advanced Techniques Course Phase 1, please apply and register for the Remote Advanced Techniques Course, Phase 1. 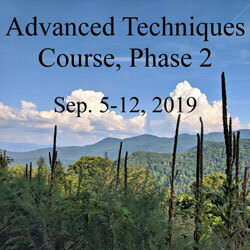 Price includes Advanced Techniques Course, all meals, all meditations, and 8 nights lodging (nights of September 4-11). Please note: The Advanced Techniques Course starts at 7:00 am with breakfast on Thursday, September 5 and ends with dinner on Thursday, September 12. If you would like to come early or stay longer and meditate with the Mount Soma Ashram, please contact the office. There will be additional charges payable upon departure. The early registration discount of $200 for first time attendees ends at midnight EDT on Wednesday, June 5, 2019. A late fee of $108 will be applied starting August 29, 2019. The Seva Option includes free room and board for the 8 days. However, people choosing this option are still required to pay the Advanced Techniques Course fee. Retreat participants have the option of attending temple ceremonies. The meditation schedule will accommodate all scheduled Pujas and Havans. However, at this time, there are no monthly or annual Pujas or Havans scheduled.